Me and Murder, She wrote is a Grove Point Press publication released in September 2013. I received a copy of this book from Netgalley and the publisher in exchange for an honest review. Peter S Fischer gives us an account of how he decided to become a writer, his first forays into screen writing which led to a few made for TV movies. This led to his writing one script for the mystery show "Columbo". Peter's script was the only one Peter Falk really liked and he kept wanting to bring Peter Fischer back for more, which he did for awhile. Eventually, Peter Fischer went on to other things, writing for other shows, and made for TV movies. One show he worked on and spoke on in detail was "Ellery Queen." 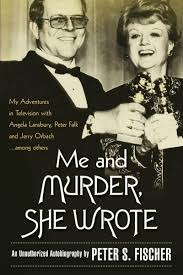 But, in 1984, Murder, She Wrote came together and the show was a huge success. Peter recalls his relationship with Angela Lansbury and the various cast members. For the most part the series went really smoothly until it just sort of ran out of steam. It is obvious that Peter really enjoyed this period in his career. There were Emmy's and Golden Globes, long friendships and fond memories. Peter's life of course knew it's share of sadness and tragedy. Some of these events taking a serious toll on his enthusiasm for his job. Peter appears to have had a solid marriage and supportive wife. I had a wonderful time remembering the Columbo mysteries and various other shows Peter worked on. My daughter and I used to watch Murder, she wrote, mainly in reruns and on Netflix and were amazed at all he guest stars. Peter remembers these scripts vividly. As he spoke of them, I did remember some pieces of those shows. I also loved the stories he told of Jerry Orbach who played a seedy detective on the show from time to time. Overall this in an A.
Peter Fischer also wrote for the Classic Mystery series Columbo.